The USPS cutoff for Christmas shipments is 12/20/18. We usually take 10-12 business days to process and then we ship. If an item is needed in less than 2 weeks, please message us before placing the order. Please allow us 24 hours to return your message. Thank you for shopping with us! Monogrammed Tote Bag - The "Arden" Tote - 20 Colors - Bridesmaids, Graduation, Mother's Day, Birthday, Just Because! I love this sweatshirt! it’s cute, an really good material. definitely recommend. I absolutely love this purse. I had one given to me previously as a gift and I wore it out! I get so many compliments. Everywhere I go, it never fails, someone will always comment on my bag! Took a while to ship due to the color/size I purchased being out of stock, but Steve kept me updated. My jacket arrived today, and it's perfect!! We are a small family owned business specializing in embroidery and vinyl personalization. 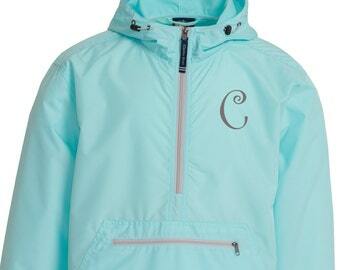 Welcome to Mad About Monograms! Our normal processing time is 10-15 BUSINESS days (Monday-Friday, excluding holidays). We have experienced delays during peak times and holidays. Please check with us BEFORE placing your order if the item(s) are needed in less than 2-3 weeks. Thank you for shopping with us! We do not accept returns as these are customized items. Please contact us if an item is lost or damaged. We will only accept cancellation requests within the first 48 hours after the order is received. If we have already begun processing the order then we will not be able to cancel. We reserve the right to keep the shipping fees to offset our costs. We use USPS First Class or Priority Mail 2-3 day shipping in most instances. We do have Rush options upon request. You will receive an email from Etsy with tracking information when the item(s) have shipped. We are not responsible for items that are lost during shipping. Once we leave the package at the post office we have no control over delivery. If your tracking information states that an item has been delivered but you have not received it please contact your local post office. Please list all the information requested in the message to seller. If something is not included, you will receive one email and one Etsy convo from us. We will hold incomplete orders for one week following communication and then we will complete the item as shown in the listing. Those unable to be completed will be refunded and canceled.